Construction meets technology. Available as an app for your computer, tablet or phone, Residential Estimate Management System is a comprehensive, easy to use program that allows you to visually estimate and manage every aspect of your projects. 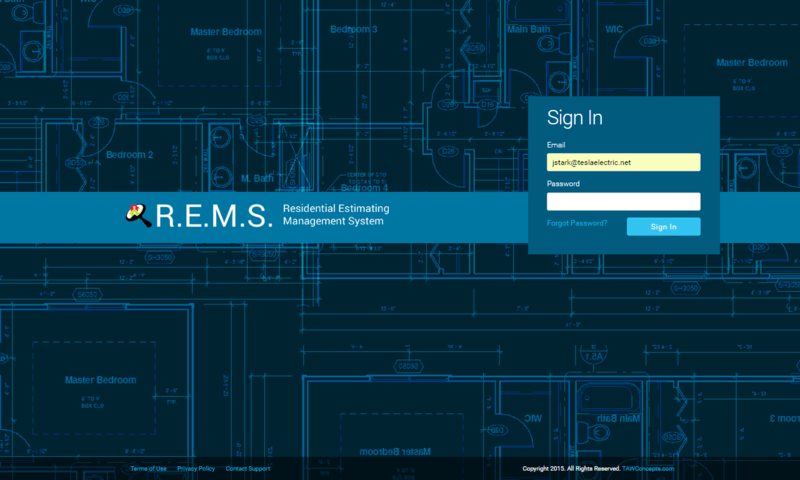 REMS is web based. This allows you to log in from any computer at any location that has internet access. 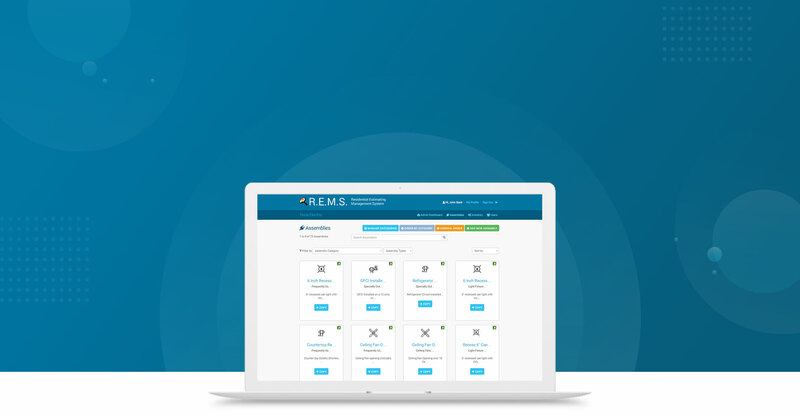 REMS allows any amount of users within your company to log in at once. REMS cloud based abilities allow your information to be updated in real time from the tablet version and the web version. REMS will keep you moving at the speed of business! Assembly construction can be complicated or you don’t feel that it gives you accurate material list. REMS eliminates the complications and gives you a chance to use your own materials from multiple vendors that you use daily. Creating these assemblies could not be any easier! Each assembly can be associated with a symbol from our library of over 400 symbols to associate to your design. Estimating just got simple! Design any plan that you import in Pdf format. REMS allows you to make the perfect design for you customers. Your design gives the professional look for your customers and automatically gives you your estimate, invoice and a list of all materials needed! REMS Inventory is based on your vendors and your parts with prices. This gives accurate estimates and the correct pick list reports. No more using generic part lists and national averages. 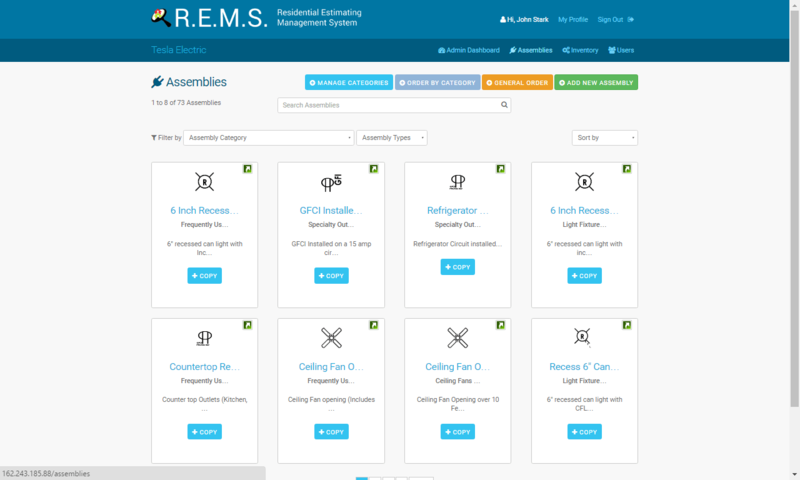 REMS changes estimating and ordering by personalizing your inventory. In the past estimates would require building a layout and then preparing a takeoff to enter your totals. Not anymore! Once your design is complete you simply generate your estimate, invoice and material lists. Savings start to accumulate with money saved on estimates and accurate material lists. 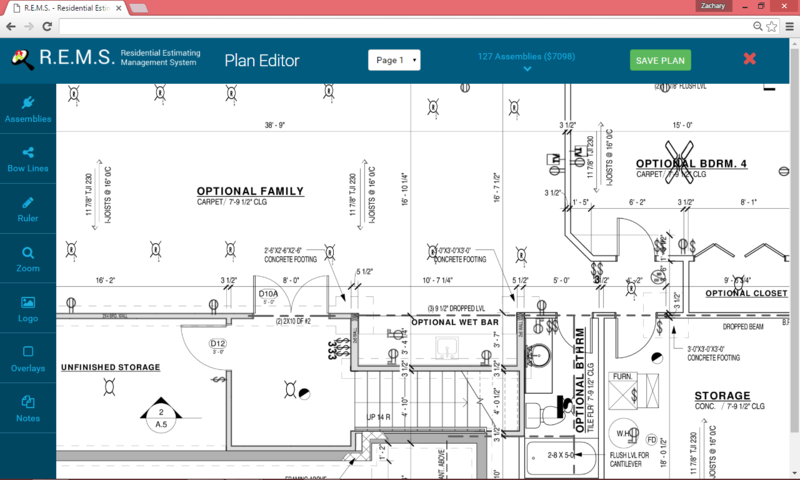 Residential estimating has never been so easy! 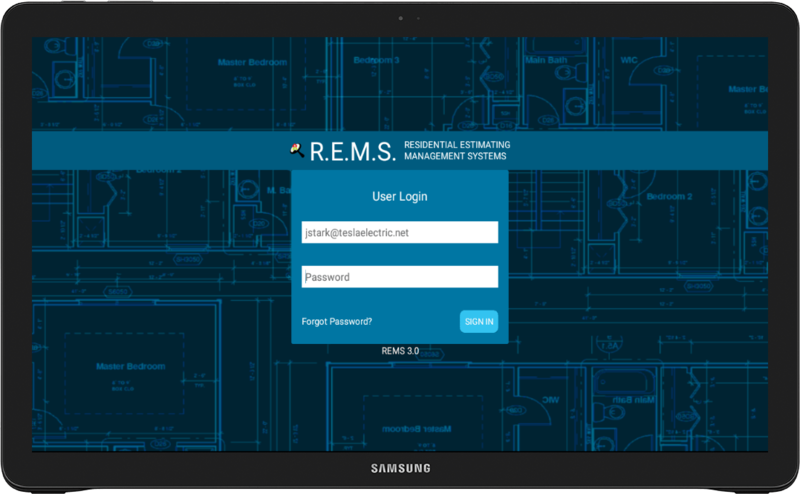 Tablet version completes the total package of REMS. Tablet allows you an auxiliary version that allows features such as editing plans, making customer changes and allowing editing and printing of panel schedules. 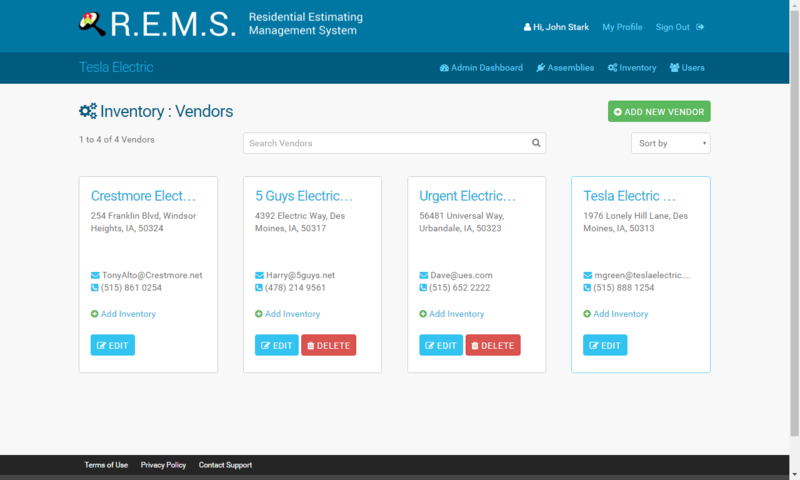 REMS is built for the ultimate tool for communicating between estimators, field managers, builders and customers. See What REMS Is All About. can watch a video that will take you through our system to show you what it’s all about. REMS Demo Editor What is REMS? No more lost time. Estimate and map out projects of any size. Upload designs of any file type or create and plan a new project directly in the system, get a full estimate for your project, down to the cost and amount of materials you’ll need as well as when you’ll need them by. Track any project or multiple projects at any stage in sequence through to full completion. No more paper. We’re in an age where computer systems and apps can facilitate anything. So why not build a system to help manage your projects? That’s exactly what we did. After years and years of on site work, REMS was designed to take all aspects of project management and combined into one easy to use and all encompassing system to manage any aspect of any project. With its multiple user options and real time updates, you can stay on top of all projects from your computer, tablet or phone. Sounds too easy? That’s because there is no system on the market like REMS. But someone had to build so we did. We’ve done the tech work for you so you don’t need to be a computer genius to use REMS. Our system was designed to make managing every aspect of any project easier for you. Plus, with our online video tutorials and available tech support, you’ll never get stuck on what to do. Fast and easy to use design upload feature or PDF designer for new projects and take offs. Letting you know what materials you’ll and when you’ll need them so you don’t have to have an infinite inventory on hand. Real time application between the web and tablets or phones allows you to manage projects in the field and see progress as it occurs. Full Quickbooks interface allows you to manage the finances and even profit margins of any project. Schedule builder to help you determine what circuits you’ll need for any project and a whole lot more. See a full list with pictures of our system features in our website menu. A Fully Responsive Design & App For Tablets and Phones. In the office or on site. 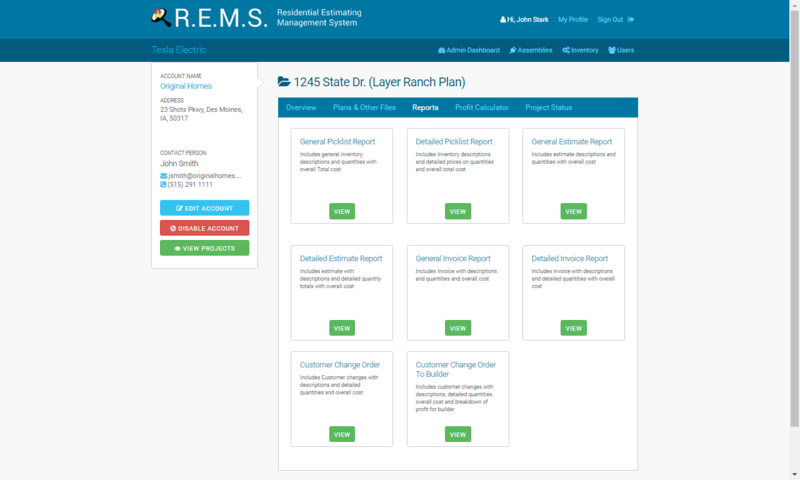 REMS offers a fully responsive design for use with any desktop or laptop computer and an app that can be download to your tablet or phone, allowing you to manage every aspect of your projects in the office or on site. Fully integrated. The program also allows for real time synchronized updates so whether you’re in the office or in the field, you’ll all be on the same page.